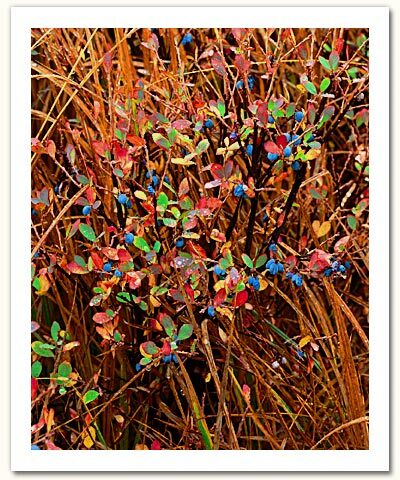 hen I left home this October day in 1993, I knew I wanted a great photograph of wild huckleberries in fall color. I had seen beautiful bushes in the past, but had never really captured the essence of them. Today would be different. I drove across the heart of volcano country, through the lava fields that served as mail route through the Cascade Mountains in the mid nineteenth century. This stunning route is now known as the Old McKenzie Pass. West of the pass, I came to this meadow and began my search. The weather was perfect for photographing plant life, overcast with no wind. The conditions provided beautiful soft light and deeply saturated colors. However, after about an hour I still had not seen my image, so I decided to move on thinking I would come back later. Locating compositions such as ‘Fall Fruit’ requires a combination of perfect conditions, being in the right place at the right time, and me feeling completely connected to my environment so that I can see the available compositions. If one of these elements is missing, rarely is a great image made. On my initial attempt, I was not connected enough. So, I moved on to other areas scouting, photographing and gradually feeling more connected as the day progressed. Numerous times I had to take refuge from the steady rain. Numerous times I thought about the huckleberry meadow. As the sun got lower in the west, I sensed an urgency to return to the first meadow. I did so, and this time I felt deeply connected in the meadow. I began slowly strolling through, softly observing the intense color and beautiful light. As I came around a large patch of huckleberries I was suddenly stopped in my tracks by the ‘Fall Fruit-Harvest Moon’ image. It was instant recognition (after eight hours that is). There was a brief break in the rain. Kneeling in the wet grass, I set up my camera and fine tuned the composition until it felt perfect. I finished exposing my film just before it became too dark to photograph. I knew I had something special when I finished. For me, there is no better feeling than connecting with Nature on such a deep level that images like ‘Fall Fruit’ come bursting forth in my vision. When all the necessary elements come together, magic becomes reality.